Of the three Barningham villages, Little Barningham is the biggest. Such contrariness is not unknown elsewhere in East Anglia, of course, and this pretty village sits in a fold of the hills to the east of Holt, its little church like a fortress above it. St Andrew underwent an overwhelming 19th century refurbishment, and the rather stark tower reflects this. The medieval building was refaced in knapped flint, and the tracery of all the windows was replaced. This happened to the chancel in the 1870s, and to the nave, porch and tower twenty years later. Fortunately, the setting is so good that the structure still stands out like the ancient sentinel it was before the Victorians took it to task. There is a fairly steep climb up to the graveyard from the west of the church, which then opens out into a a large circular area, suggesting that this was an important pre-Christian site. 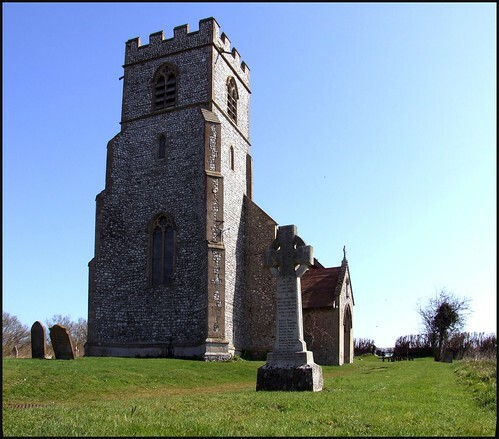 The interior is relatively plain and simple, although the survival of early 20th century Stations of the Cross around the walls suggests that St Andrew was once, like so many north Norfolk churches, resolutely in the Anglo-Catholic tradition. The major feature of the interior is the 17th century box pew which stands at the front of the north side of the nave. On its south-west corner is the large figure of a skeleton in a shroud, holding a scythe and an hour glass. This is Death himself, and the inscription, after recording that Steven Crosbee had it constructed to seat married couples, reminds us that As you are now so once was I. Remember Death, for ye must die. The pew is dated 1640, that heady time of puritan revolution, when the world turned upside down, as Christopher Hill puts it, and many parish churches became the meeting houses of some often quite off-the-wall gathered protestant communities. The puritan obsession with death was a complex one. Firstly, and most obviously, they wanted to suppress the old idea that the dead could be prayed for. This had been at the heart of Catholic theology, but the puritans wanted to affirm the Protestant Reformation, which tried to break the link between the dead and the living. Once dead, they argued, there is no hope for us, no prayers to be said, and no kindness to be expected, only judgement. Further than this, images of skulls and skeletons emphasised the physical reality of death, and reflected puritan disgust at the human body, at sexual desire and sensuality, root causes of sin. But there was also the puritan emphasis on equality, that, whether rich or poor, we would all be judged the same. All these attitudes became bundled in these images, at once horrific and yet strangely satisfactory. Unfortunately, the image of Death here is a modern copy. The original was stolen from this church in 1995, and has never been recovered. It would, of course, be impossible to sell, and so if it has not been destroyed it must still be out there somewhere, in someone's private collection. Perhaps it will emerge again one day. On this bright spring day, the altar frontal was very appropriate, depicting birds, flowers, lambs and the like, the world coming back to life. I doubt that the puritans would have approved of it. And then, after briefly wondering how on earth the parish shoe-horned that organ into the space beneath the tower, we stepped out into the sunshine again.